In working with high school interns last year, I was asked to write about our program. I sent this in to a local newspaper. It sums up my feelings about a liberal arts education. What was great was to see how excited these kids were to learn. They listened to me talk about geometry and physics. They asked questions about these subjects. They listened to me talk about joinery and cutting angles. They were to a person all interested in learning. And that’s what education should be about: curiosity and the excitement of discovery. Add on that you get to put your hands on tools and it’s a slam dunk for just about every demographic. But certainly it is of vital importance for our kids. Please let all our educators know that hands on education needs to be back in every school. 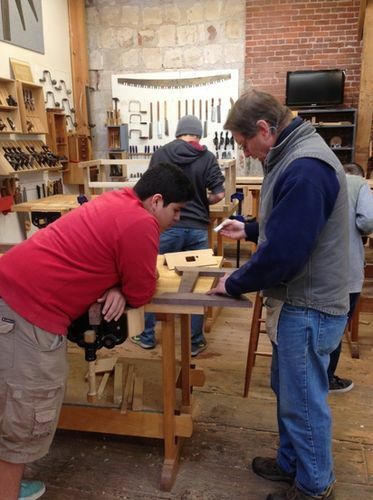 From the arts to music to shop class, we need to train our kids in the broadest possible way. This is called a liberal arts education. I’m a fan of it. Join us on the 11th of September for a fundraiser in support of the WIN program. We’re trying to expand our efforts into local Portland area schools. agreed, well rounded is the base of an open mind. Thanks for posting Gary! I’m with you Gary. Most people our age would have been handed a spray gun at some point in our school career. I was at about 15 in my high school shop class. I also took a variety of music classes. Sadly, neither of my kids were given the same opportunities. Life isn’t all computers, not yet anyway. Valid comments and observations!!!! I liberal arts education should be about education and learning deductive reasoning; and, not an indoctrination camp of political views and philosophies where no descent or question is permitted. I went to one of the first magnet schools in Chicago. 5000 guys. It’s now co ed. I had wood, electric, and several courses in Machine shop along with higher math English physics and chemistry. I went to the Art institute of Chicago on Saturdays. I believe it was a well rounded education. Young minds are the thing we waste the most. Good luck in Portland Gary! I had an opportunity to work in trades school for 2 years. The first time I “subbed” for instructor I looked across the desk and said to myself. “IF I were those kids sitting in this classroom” listening to me “READING” the lesson I would be sleeping too. I was told to just go in a read the lesson. How boring is that. I sat in on some classes and thought I was in a Charlie Brown cartoon. WA WA WA. When I had the class for 1 week I TOOK props into class, we all touched them, talked about them,. etc. The entire class stayed awake, they passed their quizzes that week as well. I thought to myself, that is how I wanted to learn…HANDS ON,,,MORE SHOP. The second semester my boss agreed, more shop time, make the class fun and enjoyable. I only had small class, I did find out they had TALENT ! IF given the chance people can do it !